Ballotpedia covers local measures that appear on the ballot for voters within the top 100 largest cities in the U.S., including Austin, Dallas, El Paso, Garland, and Plano, Texas. On May 4, we are covering a total of 15 local ballot measures in Texas. Dallas County Community College District voters will decide on Proposition A, a $1.102 billion bond issue designed to fund school building construction and upgrades. Garland voters in Dallas County will weigh in on eight bond measures totaling $423.7 million in proposed new debt. The measures are designed to fund a variety of projects, including street improvements, public safety facility construction and upgrades, and recreational facility construction and upgrades. Also on the ballot is Proposition A-1, which asks Garland voters whether or not to authorize the city to sell Bunker Hill Park, with funds dedicated to public parks. Plano voters in Collin County will weigh in on three bond measures totaling $44,665,000 in proposed new debt. The measures are designed to fund improvements to streets, parks and recreational facilities, and municipal facilities. Eanes Independent School District in Travis County has one $80 million bond measure on the ballot, and El Paso County voters will decide on a citizen initiative designed to prohibit private development and public roadways on land that includes the Lost Dog trail system. Early voting for the May 4 elections begins on Monday, April 22. Voters in at least two states, Arkansas and Montana, will decide ballot measures in 2020 concerning distribution requirements for future initiative signature petition drives. A distribution requirement is a rule requiring that petitions for a ballot measure or candidate must be signed by a minimum number or percent of voters from different political subdivisions in order for the ballot measure or candidate to qualify for the ballot. In Arkansas, House Joint Resolution 1008 would amend the state constitution to require signature gathering to be spread out over at least 45 counties (three-fifths of the state’s 75) instead of the current requirement of 15 counties. HJR 1008 also proposes changes to many other aspects of direct democracy in Arkansas, such as increasing the majority required for the legislature to put an amendment on the ballot to three-fifths, eliminating a grace period for additional signature gathering, and moving the deadline for signature submission and legal challenges forward to earlier in an election year. In Montana, the two amendments on 2020 ballots would not change the currently enforced distribution requirement. Rather, they would codify in the state constitution the distribution requirement currently in effect because of a court ruling and an opinion by the state attorney general. Going into 2019, 17 of the 26 states with an initiative or veto referendum process had a distribution requirement. Of the 17 with a distribution requirement, nine are Republican trifectas, five have divided government, and three are Democratic trifectas. Of the nine states with initiative or referendum processes but without a distribution requirement, four are Republican trifectas, and five are Democratic trifectas. The most recent state to enact distribution requirements was Michigan in the state legislature’s 2018 lame duck session. The Idaho State Legislature passed a pair of bills earlier this month to increase the state’s initiative signature requirement and its distribution requirement, among other restrictions. Governor Brad Little (R) vetoed the bills, however, citing a fear that they would draw a lawsuit. Lawmakers in Arizona, Maine, and Missouri also considered or are considering distribution requirements during 2019 sessions. Colorado was the state to most recently begin enforcing a distribution requirement. In 2016, voters approved Amendment 71, which was a citizen initiative enacting a distribution requirement (as well as a supermajority vote requirement) for initiated constitutional amendments requiring signature gathering to be spread out over all of the state’s 35 state senate districts. Since no initiated constitutional amendments were circulated in 2017, 2018 was the first election year in which the requirement was enforced. Three initiated constitutional amendments qualified for the 2018 ballot: (1) Amendment 73, designed to increase income taxes for higher income brackets to fund education; (2) Amendment 74, designed to require that property owners be compensated for any reduction in property value caused by state laws or regulations; and (3) Amendment 75, designed to increase campaign contribution limits if one candidate spends more than $1 million on his or her own campaign. None of the amendments were approved by voters. The average number of initiated constitutional amendments on the ballot in Colorado during even-numbered years since 2006 was four. In the 17 states where there are distribution requirements for initiative petitions, the political jurisdiction upon which they are based varies. In seven states, the distribution requirement is spread out over a state’s counties (Arkansas, Massachusetts, Maryland, Nebraska, New Mexico, Ohio, and Wyoming). In five states, it is calculated based on state legislative districts (Alaska, Colorado, Idaho, Montana, and Utah). In the other five states with a distribution requirement, it is based on U.S. congressional districts (Florida, Michigan, Mississippi, Missouri, and Nevada). Washington, D.C., also has a distribution requirement based on city wards. The 76 and 68 citizen-initiated measures across the country in 2016 and 2018, respectively, were well above the average of 49 per even-numbered year from 2008 through 2014. Moreover, new trends emerged such as elections policy and redistricting, Medicaid expansion, and renewable energy and were added to initiative staples such as marijuana, minimum wage, and taxes. With the increased initiative activity, state legislators have been giving the initiative process more attention, and one of the most common restrictions considered are distribution requirements. Two factors go into determining how difficult a signature distribution requirement is to meet: (1) from what percentage of the jurisdictions must signatures be collected (i.e. from how much of the state must at least some signatures be collected) and (2) how large the requirement is in each jurisdiction (i.e. how evenly must the signature gathering be spread out across the state). For an example of the first factor, Arkansas’ current requirement of 15 counties is 20 percent of the state’s total 75 counties, and HJR 1008 would increase that to 60 percent. Across the 17 states with initiative distribution requirement, the first factor ranges from 20 percent to 100 percent of the relevant jurisdictions. Michigan’s newly enacted distribution requirement features 50 percent distribution because it requires signatures to be collected from a minimum of seven out of 14 congressional districts. The second factor concerning how evenly gathering must be spread out can be represented by how many of the total number of signatures required is needed to meet the distribution requirement. For example, to qualify for the Alaska 2020 ballot, a minimum of 14,963 signatures are required to just meet the distribution requirement in the state, which is 52.5 percent of the total signature requirement of 28,501. While in Arkansas, the current 2020 requirement mandates a rate of 10 percent for this second factor, and HJR 1008 would change that to 30 percent. This rate ranges from 10 percent to 100 percent among all 17 states with initiative distribution requirements. This edition of the State Ballot Measure Monthly covers certifications from March 16 through April 15 and takes a look at Ballotpedia’s analysis of states requiring legislative approval in two sessions to refer constitutional amendments. 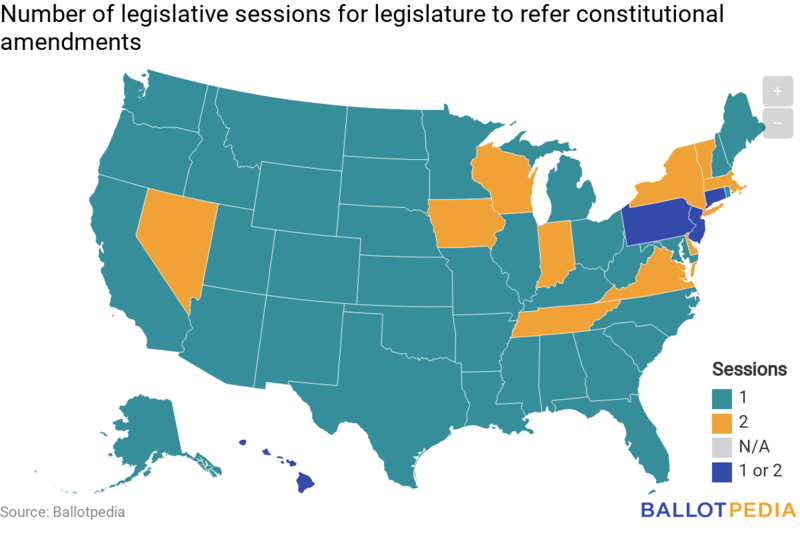 Ballotpedia’s analysis shows that state legislatures in states with a two-session vote requirement refer fewer constitutional amendments to the ballot. One statewide ballot measure was certified for the 2019 ballot in Kansas, bringing the 2019 total to two in two states. Seven ballot measures were certified for the 2020 ballot in Arkansas, Montana, Nevada, and North Dakota, bringing the 2020 total to 21 in 11 states. All of the new measures were legislative referrals. Seven are constitutional amendments, and one is a state statute in Montana concerning local control over concealed-carry laws designed to only go on the ballot if Governor Steve Bullock (D) vetoes an identical bill. The seven amendments concern term limits, the census and redistricting, citizen initiative and legislative referral requirements, and the governance of higher education. Initiated Ordinance 300 (I-300), named the “Right to Survive” Initiative by proponents, is on the ballot for voters in Denver, Colorado, on May 7. The citizen initiative has seen $1.6 million spent on campaigns, with $1.52 million in donations reported by “Together Denver – No on 300″ and $80,000 reported by “Yes On 300 Right To Survive.” Mail-in ballots will be sent to registered Denver voters beginning on April 15 containing this measure and other municipal races. I-300 was designed to allow activities such as sleeping and sheltering oneself in public outdoor places—acts that are currently prohibited by Denver’s unauthorized camping ban, which was passed by the city council in 2012. The city of Denver stated in an impact report that, if approved, I-300 would be the first initiative of its kind implemented in the nation. I-300 provides a list of rights that specifically concern homeless individuals, including the “right to rest and shelter oneself from the elements in a non-obstructive manner in outdoor public spaces.” While similar provisions under laws known as the “Homeless Bill of Rights” are codified in Illinois and Rhode Island, among other places, I-300 goes further by proposing to hold the city, county, law enforcement, or any other entity liable if that entity violates the rights listed in the initiative. Initiative supporters have stated that the existing unauthorized camping law “targets Denver’s homeless, but fails to take into account that there are not enough shelter beds for everyone in need.” The “Yes on 300” campaign website states that I-300 would be a first step toward helping individuals experiencing homelessness sleep, find and hold down jobs, and find housing. Opponents have responded by saying that I-300 would threaten the quality of life for Denver citizens and prohibit officials from enforcing public safety laws. The “No on 300” website also states that the “Right to Survive” Initiative would fail to provide new services or address the causes of homelessness. I-300 supporters have reported $81,514 in contributions to the “Yes on 300” campaign, with a top donation of $26,196 from Kayvan for Denver (former mayoral candidate Kayvan Khalatbari’s organization). The “No on 300” effort, led by Together Denver, has seen over $1.5 million in contributions, with top donors Downtown Denver Partnership and the National Association of Realtors each contributing $200,000. Proponents of the “Right to Survive” Initiative submitted over 9,000 petition signatures to the Denver Elections Division in October 2018 to place I-300 on the ballot. Previously, proponents backed a 2014 bill at the state level known as the “Right to Rest Act,” sponsored by state Reps. Joe Salazar (D) and Jovan Melton (D). The act contained similar provisions to I-300, including “the right to use and move freely in public spaces.” Though it was reintroduced in 2015, 2016, and 2017, the “Right to Rest Act” never went to a vote in the legislature. Denver voters will have a chance to weigh in on the “Right to Survive” Initiative starting the week of April 15, when vote-by-mail ballots are set to go out. All ballots must be received by 7:00 pm on election day, May 7. Denver voters are also deciding Initiative 301—a first-of-its-kind initiative to decriminalize psilocybin mushrooms—and races for mayor, city auditor, city clerk, and all 13 city council seats. The legislatures of 49 states are required to refer proposed constitutional amendments to the ballot for voter consideration. Most of the states (36 of 49) require legislatures to approve the amendments during one legislative session. An additional four states allow amendments to be passed during one or two successive legislative sessions, depending on how many lawmakers vote in favor. The remaining nine states require legislatures to approve amendments twice—once during one legislative session, and then again during the next legislative session. Delaware does not require constitutional amendments passed by the legislature to be referred to voters. The two-session requirement means that a legislature can approve an amendment, and then, during the following session, reject the amendment or exclude the amendment from a floor vote. Between the 2010 and 2018 legislative sessions, 62 constitutional amendments were approved during one legislative session in those states with two-session vote requirements. However, 21 of these constitutional amendments (33.9 percent) failed during the second legislative session. An average of 0.5 constitutional amendments were referred to the ballot in each two-session state per year between 2010 and 2018. This compares to an average of 0.7 constitutional amendments per year that were passed in the first session and would have been on the ballot without the two-session requirement. The average for states where just one legislative session is required to refer an amendment was 1.6 per state per year. With the outliers of Alabama and Louisiana removed, the average in these states was 1.3 per state per year. The two-session requirement means political variables—such as party control of legislative chambers and leadership—can change between sessions. These changes can influence whether an amendment fails to make the ballot despite receiving initial approval. When there was a change in party control of the legislature between legislative sessions, 90.0 percent of the constitutional amendments approved during the first session failed during the second session. When the same party kept control of the legislature between legislative sessions, 23.1 percent of the constitutional amendments approved during the first session failed during the second session.